Based out of the city of Chihuahua, Mexico, the client is a General Design and Construction contractor with international repute. With a number of prestigious building construction projects to its account, the client is known for its specialized services for industrial, institutional, and commercial properties. As an integral service provider, the client has carved a niche for itself by delivering cost-effective services within the stipulated time to its growing list of clients. 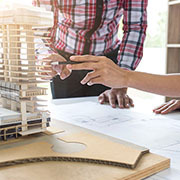 With more than 600 top buildings to its name, the client focuses on safety and sustainability of the buildings through centralized service provisioning with BIM. The client wanted help in creating a bill of quantity (BoQ) for a proposed extension to an existing building. The client wanted to understand the contractual requirements of the proposed extension in a professional way which adhered to the international codes and standards. They provided the drawings of the existing building as well as the proposed extension for BoQ generation. The requirement involved conducting a thorough material take out (MTO) for tasks including masonry, concrete works, excavation work, etc. The outputs needed to follow the Construction Specifications Institute (CSI) format to ensure international standards and guidelines are cross-checked while deriving the BoQ. The challenges included difficulty in understanding and analyzing the building drawings as everything was written in Spanish. This posed as a threat to delay the overall delivery of the project. The proactive and skilled team at Outsource2india considered the language challenges at the initial analysis and devised a thorough communication strategy to involve the client along with a team of professional translators to do an accurate reading of the drawings. Once the client and the team were clear about the terminology used in the drawings, the BoQ task was swiftly carried out and completed within 5 working days. The client was extremely delighted at the proactivity of the team and the dedication for details and accuracy the team exhibited during the project. The team included 2 experienced expert drafters and a team leader to ensure smooth and precise execution of the project. We are now a choiced partner for this client and are working on a number of major projects with them. Outsource2India provides highly accurate and professional BoQ services to help our growing list of clients. We not only help you with cost estimation for each segment and section of the project, but also provide you ample insights on material, time, and resources required to successfully carry out a project. We help you document each aspect of the project to provide you a complete support solution for your civil and structural engineering support needs. We adhere to ISO quality standards and offer affordable and cost-effective solutions for a number of major services. Outsource2india has been a leading provider of BoQ services and a series of other structural engineering services. We have been in the industry for almost two decades now and have the required experience and skills to cater to the client's precise requirements. We follow some of the most efficient processes which ensure that we deliver the best-quality results within a quick turnaround time and at highly affordable prices. If you are looking for a reliable, effective, and cost-effective structural engineering services provider, then you have come to the right place. Contact us today to learn how we can prove to be a valuable support services partner to you.